Former Chairman of Singer Sri Lanka Hemaka Amarasuriya whose multi-hued personality encompasses large doses of extraordinary leadership abilities tempered with determination, a quiet firmness and an indomitable strength to make him one of the most revolutionary non-conformist marketing ‘accountants’ launched his biography ‘Riding the zeitgeist – The Hamaka Amarasuriya Story’ recently. 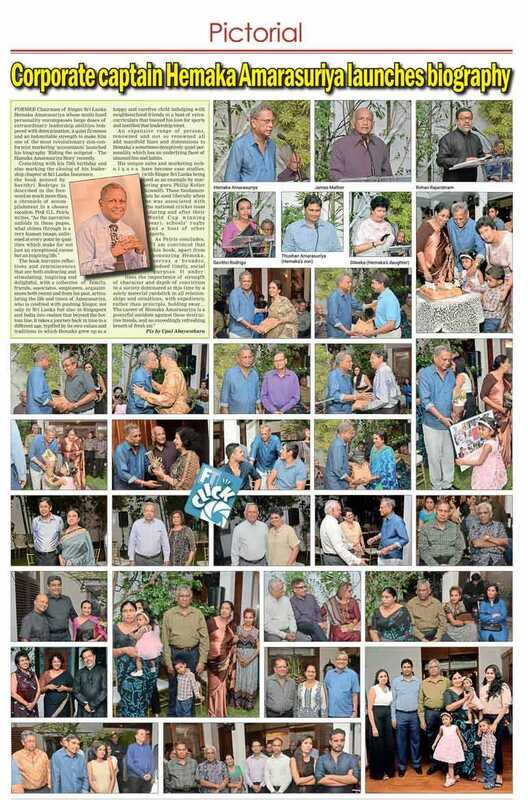 The book narrates reflections and reminiscences that are both endearing and stimulating, inspiring and delightful, with a collective of family, friends, associates, employees, acquaintances both recent and from his past, articulating the life and times of Amarasuriya, who is credited with pushing Singer, not only in Sri Lanka but also in Singapore and India into realms that beyond the bottom line. It takes a journey back in time to a different age, typified by its own values and traditions in which Hemaka grew up as a happy and carefree child indulging with neighbourhood friends in a host of extracurriculars that buoyed his love for sports and instilled that leadership tenet. An expansive range of persons, renowned and not so renowned all add manifold hues and dimensions to Hemaka’s sometimes deceptively quiet personality, which has an underlying facet of unusual fun and habits. His unique sales and marketing techniques have become case studies, (with Singer Sri Lanka being used as an example by marketing guru Philip Kotler himself). These fundamentals he used liberally when he was associated with the national cricket team (during and after their World Cup winning year), schools’ rugby and a host of other sports.